Plants obtain food in two different ways. Autotrophic plants can make their own food from inorganic raw materials, such as carbon dioxide and water, through photosynthesis in the presence of sunlight. Green plants are included in this group. Some plants, however, are heterotrophic: they are totally parasitic and lacking in chlorophyll. These plants, referred to as holo-parasitic plants, are unable to synthesize organic carbon and draw all of their nutrients from the host plant. Plants may also enlist the help of microbial partners in nutrient acquisition. Particular species of bacteria and fungi have evolved along with certain plants to create a mutualistic symbiotic relationship with roots. This improves the nutrition of both the plant and the microbe. The formation of nodules in legume plants and mycorrhization can be considered among the nutritional adaptations of plants. However, these are not the only type of adaptations that we may find; many plants have other adaptations that allow them to thrive under specific conditions. This video reviews basic concepts about photosynthesis. In the left panel, click each tab to select a topic for review. The most important source of BNF is the symbiotic interaction between soil bacteria and legume plants, including many crops important to humans ((Figure)). The NH3 resulting from fixation can be transported into plant tissue and incorporated into amino acids, which are then made into plant proteins. Some legume seeds, such as soybeans and peanuts, contain high levels of protein, and serve among the most important agricultural sources of protein in the world. Farmers often rotate corn (a cereal crop) and soy beans (a legume), planting a field with each crop in alternate seasons. What advantage might this crop rotation confer? Soil bacteria, collectively called rhizobia, symbiotically interact with legume roots to form specialized structures called nodules, in which nitrogen fixation takes place. This process entails the reduction of atmospheric nitrogen to ammonia, by means of the enzyme nitrogenase. Therefore, using rhizobia is a natural and environmentally friendly way to fertilize plants, as opposed to chemical fertilization that uses a nonrenewable resource, such as natural gas. Through symbiotic nitrogen fixation, the plant benefits from using an endless source of nitrogen from the atmosphere. The process simultaneously contributes to soil fertility because the plant root system leaves behind some of the biologically available nitrogen. As in any symbiosis, both organisms benefit from the interaction: the plant obtains ammonia, and bacteria obtain carbon compounds generated through photosynthesis, as well as a protected niche in which to grow ((Figure)). A nutrient depletion zone can develop when there is rapid soil solution uptake, low nutrient concentration, low diffusion rate, or low soil moisture. These conditions are very common; therefore, most plants rely on fungi to facilitate the uptake of minerals from the soil. Fungi form symbiotic associations called mycorrhizae with plant roots, in which the fungi actually are integrated into the physical structure of the root. The fungi colonize the living root tissue during active plant growth. Through mycorrhization, the plant obtains mainly phosphate and other minerals, such as zinc and copper, from the soil. The fungus obtains nutrients, such as sugars, from the plant root ((Figure)). Mycorrhizae help increase the surface area of the plant root system because hyphae, which are narrow, can spread beyond the nutrient depletion zone. Hyphae can grow into small soil pores that allow access to phosphorus that would otherwise be unavailable to the plant. The beneficial effect on the plant is best observed in poor soils. The benefit to fungi is that they can obtain up to 20 percent of the total carbon accessed by plants. Mycorrhizae functions as a physical barrier to pathogens. It also provides an induction of generalized host defense mechanisms, and sometimes involves production of antibiotic compounds by the fungi. There are two types of mycorrhizae: ectomycorrhizae and endomycorrhizae. Ectomycorrhizae form an extensive dense sheath around the roots, called a mantle. Hyphae from the fungi extend from the mantle into the soil, which increases the surface area for water and mineral absorption. This type of mycorrhizae is found in forest trees, especially conifers, birches, and oaks. Endomycorrhizae, also called arbuscular mycorrhizae, do not form a dense sheath over the root. Instead, the fungal mycelium is embedded within the root tissue. Endomycorrhizae are found in the roots of more than 80 percent of terrestrial plants. Some plants cannot produce their own food and must obtain their nutrition from outside sources. This may occur with plants that are parasitic or saprophytic. Some plants are mutualistic symbionts, epiphytes, or insectivorous. 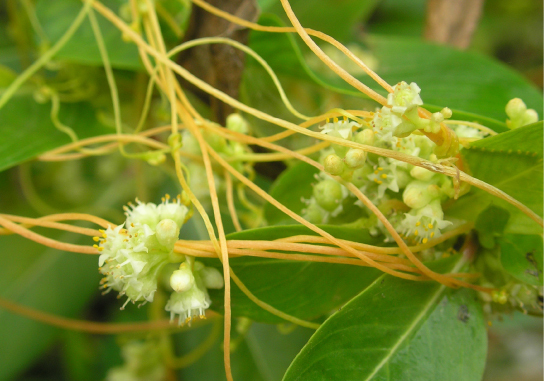 A parasitic plant depends on its host for survival. Some parasitic plants have no leaves. An example of this is the dodder ((Figure)), which has a weak, cylindrical stem that coils around the host and forms suckers. From these suckers, cells invade the host stem and grow to connect with the vascular bundles of the host. The parasitic plant obtains water and nutrients through these connections. The plant is a total parasite (a holoparasite) because it is completely dependent on its host. Other parasitic plants (hemiparasites) are fully photosynthetic and only use the host for water and minerals. 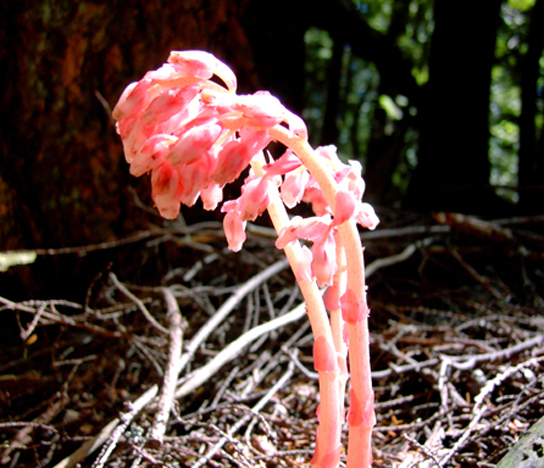 There are about 4,100 species of parasitic plants. A saprophyte is a plant that does not have chlorophyll and gets its food from dead matter, similar to bacteria and fungi (note that fungi are often called saprophytes, which is incorrect, because fungi are not plants). Plants like these use enzymes to convert organic food materials into simpler forms from which they can absorb nutrients ((Figure)). Most saprophytes do not directly digest dead matter: instead, they parasitize fungi that digest dead matter, or are mycorrhizal, ultimately obtaining photosynthate from a fungus that derived photosynthate from its host. Saprophytic plants are uncommon; only a few species are described. A symbiont is a plant in a symbiotic relationship, with special adaptations such as mycorrhizae or nodule formation. Fungi also form symbiotic associations with cyanobacteria and green algae (called lichens). Lichens can sometimes be seen as colorful growths on the surface of rocks and trees ((Figure)). The algal partner (phycobiont) makes food autotrophically, some of which it shares with the fungus; the fungal partner (mycobiont) absorbs water and minerals from the environment, which are made available to the green alga. If one partner was separated from the other, they would both die. An epiphyte is a plant that grows on other plants, but is not dependent upon the other plant for nutrition ((Figure)). Epiphytes have two types of roots: clinging aerial roots, which absorb nutrients from humus that accumulates in the crevices of trees; and aerial roots, which absorb moisture from the atmosphere. 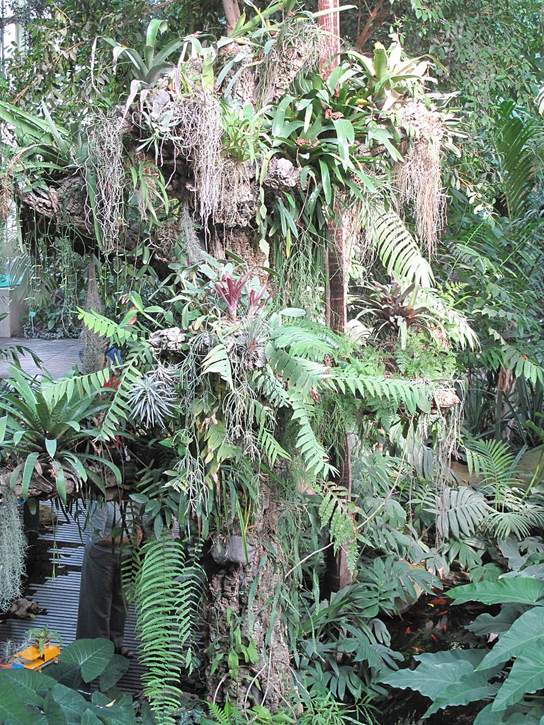 These epiphyte plants grow in the main greenhouse of the Jardin des Plantes in Paris. An insectivorous plant has specialized leaves to attract and digest insects. 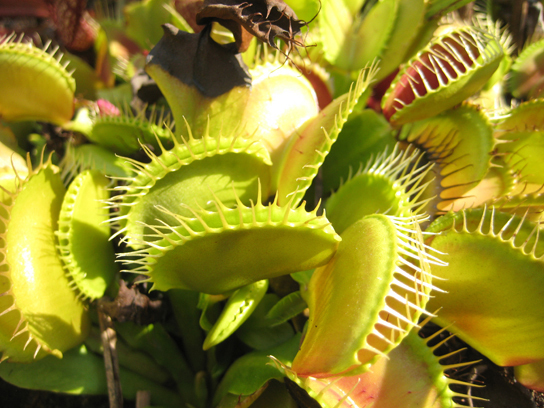 The Venus flytrap is popularly known for its insectivorous mode of nutrition, and has leaves that work as traps ((Figure)). The minerals it obtains from prey compensate for those lacking in the boggy (low pH) soil of its native North Carolina coastal plains. There are three sensitive hairs in the center of each half of each leaf. The edges of each leaf are covered with long spines. Nectar secreted by the plant attracts flies to the leaf. When a fly touches the sensory hairs, the leaf immediately closes. Next, fluids and enzymes break down the prey and minerals are absorbed by the leaf. Since this plant is popular in the horticultural trade, it is threatened in its original habitat. Atmospheric nitrogen is the largest pool of available nitrogen in terrestrial ecosystems. However, plants cannot use this nitrogen because they do not have the necessary enzymes. Biological nitrogen fixation (BNF) is the conversion of atmospheric nitrogen to ammonia. The most important source of BNF is the symbiotic interaction between soil bacteria and legumes. The bacteria form nodules on the legume’s roots in which nitrogen fixation takes place. Fungi form symbiotic associations (mycorrhizae) with plants, becoming integrated into the physical structure of the root. Through mycorrhization, the plant obtains minerals from the soil and the fungus obtains photosynthate from the plant root. Ectomycorrhizae form an extensive dense sheath around the root, while endomycorrhizae are embedded within the root tissue. Some plants—parasites, saprophytes, symbionts, epiphytes, and insectivores—have evolved adaptations to obtain their organic or mineral nutrition from various sources. (Figure) Farmers often rotate corn (a cereal crop) and soy beans (a legume) planting a field with each crop in alternate seasons. What advantage might this crop rotation confer? (Figure) Soybeans are able to fix nitrogen in their roots, which are not harvested at the end of the growing season. The belowground nitrogen can be used in the next season by the corn. Which process produces an inorganic compound that plants can easily use? 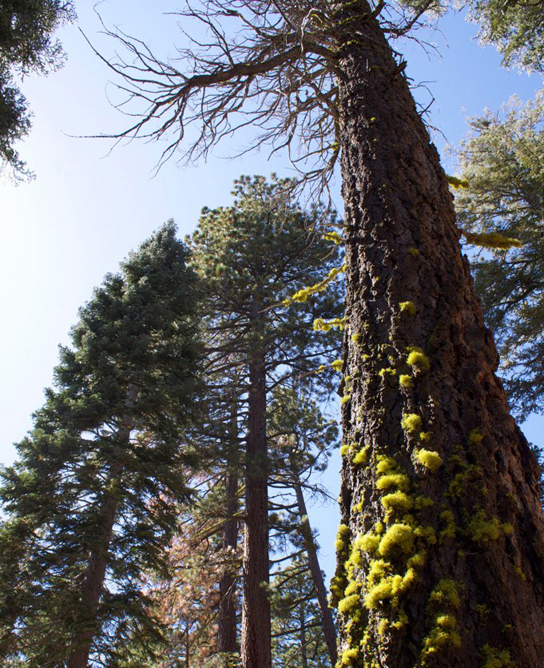 Through mycorrhization, a plant obtains important nutrients such as ________. What term describes a plant that requires nutrition from a living host plant? What is the term for the symbiotic association between fungi and cyanobacteria? Why is biological nitrogen fixation an environmentally friendly way of fertilizing plants? Because it is natural and does not require use of a nonrenewable resource, such as natural gas. What is the main difference, from an energy point of view, between photosynthesis and biological nitrogen fixation? Photosynthesis harvests and stores energy, whereas biological nitrogen fixation requires energy. Why is a root nodule a nutritional adaptation of a plant? 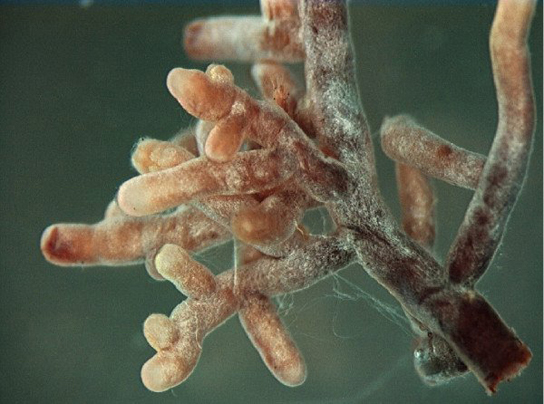 A nodule results from the symbiosis between a plant and bacterium. Within nodules, the process of nitrogen fixation allows the plant to obtain nitrogen from the air. Nutritional Adaptations of Plants by OpenStax Biology 2nd Edition is licensed under a Creative Commons Attribution 4.0 International License, except where otherwise noted.